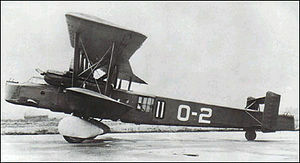 The Vickers Type 163 was a prototype British biplane bomber design of the 1930s built by Vickers-Armstrong. It was based on the Vickers Vanox (Vickers "Type 150") scaled up to take four engines in paired mountings. It was submitted both as a bomber and as a troop carrier to Air Ministry specifications B.19/27 and C.16/28 respectively first flying on 12 January 1931. Only one was produced.